Tongs are one of the best kitchen inventions of all time, that's why we use them every day. The problem is that you can't put them down when you're not using them without making a mess and they aren't easy to open and close. Clongs solves these problems - click-lock tongs that sit up off the bench or counter. With the click of a button, your Clongs open or lock closed when you want them to, which makes them incredibly easy to use. Best of all, when you're not using them you can put them down anywhere without the tips touching the bench because the unique bend in the handles makes sure they sit up. 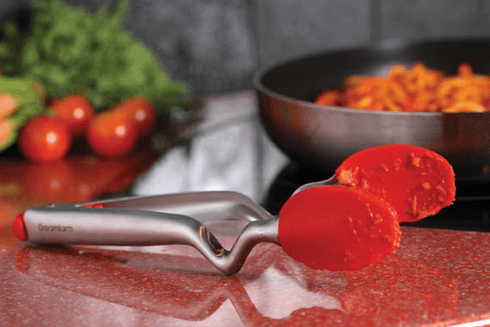 The clever bend means no mess to clean up and no germs getting onto your tongs and into your food. Clongs have silicone tips which won't scratch your non-stick cookware and are heat-resistant to 260 degree C/500 degree F so you can use them on anything from your frying pan to barbeque.